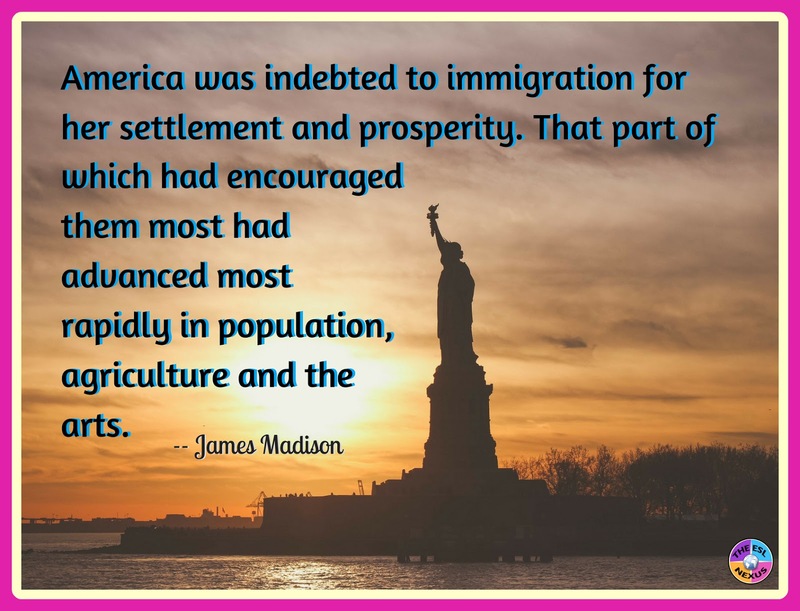 "America was indebted to immigration for her settlement and prosperity. That part of which had encouraged them most had advanced most rapidly in population, agriculture and the arts." 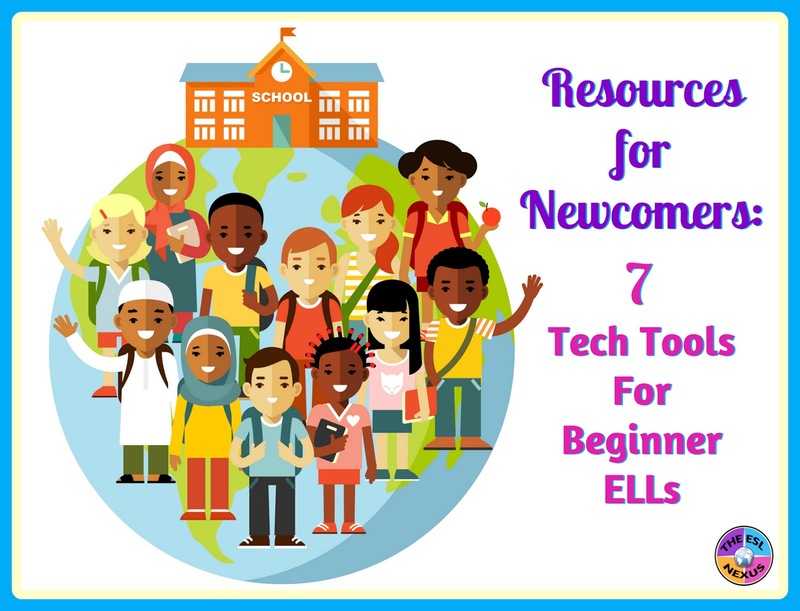 Yesterday in the #ELLEdTech chat, Laurah and I discussed technology tools for helping newcomers, which we defined as English Language Learners from other countries who have very low proficiency levels of English. Teaching these students is challenging, especially if they arrive in the middle of the school year and it means rearranging your schedule, which happened to me on more than one occasion. When I first started teaching, I didn’t like working with beginner-level ELLs but as time went on, my attitude changed and I came to really enjoy teaching them. It was so easy to see the progress they made and that was really gratifying. In this blog post, I’d like to share some of the resources that were mentioned in our Twitter chat. In the future, I’ll write about other resources for newcomers that are not technology-based. These resources can be utilized by both ESL and mainstream teachers who have newcomers in their classes. Newcomer programs are temporary, transitional programs for recently arrived immigrant ELs at the earliest levels of English language proficiency, often referred to as newcomers(Friedlander, 1991). They are designed to meet the unique needs of this population; among their goals are helping students develop basic English language skills, providing instruction in core content areas in preparation for participation in general education classrooms, developing multicultural understanding and intercultural communication, and guiding students through the acculturation process in American schools (Friedlander, 1991; Short & Boyson, 2012). 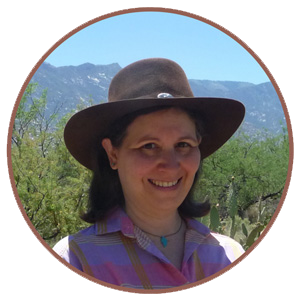 * One of Laurah’s favorite tools for vocabulary learning for newcomers is Learning Chocolate. She said, “It's great because it involves all 4 language domains with vocabulary practice & has visuals.” First you listen to the words and phrases, and then you can play the games for free; if you want to add your own, though, you have to register. There are versions in US English, UK English, Chinese (written versions in traditional and simplified Chinese, Japanese, Spanish, and German. There is also a page with links to other sites for learning English. * “Another great tool to help newcomers to communicate,” according to Laurah, “is Picto4me, a free Google Chrome app. This is great for making word walls or communication boards and allows you to create printable communications boards for varied purposes.” A communication board is a grid with images on it, similar to a Bingo or Jingo board. Laurah wrote a blog post that explains why this app is good for ELLs. * Laurah also loves Read&Write for Chrome by TextHelp. “Read&Write for Chrome is great for providing accommodations or read-alouds for students with low proficiency -- it will read aloud documents (tests or quizzes, for example) as well as websites. You can use it for whole text or parts of a text. It also has translation and annotation features.” You can see how it works on their website by clicking on the orange icon with headphones in the upper right corner of your screen. A single use subscription for one year is $145 and other options are available as well. * Imagine Learning is another tool that Laurah says the teachers she works with love. This is a paid program that offers instruction in reading, speaking, and listening skills, grammar, and vocabulary. Translation into 15 languages is available. Other programs are for math, struggling readers and special education students. Ideally used on tablets but can also be used on computers. I couldn't find any pricing info online, which to me implies it's expensive and probably not something individual teachers would purchase on their own. * Seesaw, suggested by Shaeley Santiago, is a program for creating digital portfolios. It works on computers as well as tablets and other devices. Students can upload written work, photos, videos, links, and more to make a portfolio. There is a free version and paid versions that offer more features. * I recommended BrainPop ESL. BrainPop ESL is part of the BrainPop group of programs and is aimed specifically at English Language Learners. It offers videos (with two recurring characters), activities, and games that teach various language skills at 3 different levels. Some free content is available but the paid version offers more material; an annual subscription for 1 classroom is $150. Other plans are also available. This page (ignore the Chinese text and click on the video) explains all the features on the Brain Pop ESL site. * In a course I took earlier this year, I learned about Vocaroo. I haven’t used it in the classroom but it’s a free program that lets you make audio recordings online and is really simple to use. You can record instructions for activities, homework assignments, or messages for students, to name a few possibilities. You can also use Vocaroo for assessment purposes by recording students at the beginning of the school year and then again at the end. You can download the recordings in various formats, email them, or create a QR code for them, which I think is pretty neat. I hope this gives you some ideas for resources you can use with your newcomers. I’d love to hear what else works well – just add your suggestions in the Comments below.